The holidays are officially over! Yes, I believe in the 12 days of Christmas and that the holidays officially end on January 6th. Too bad I can’t gifts like the song though, not necessarily 5 golden rings, but maybe 5 skeins of yarn and 4 pairs of shoes as opposed to the calling birds. You catch my drift. All in all though my holidays were good. 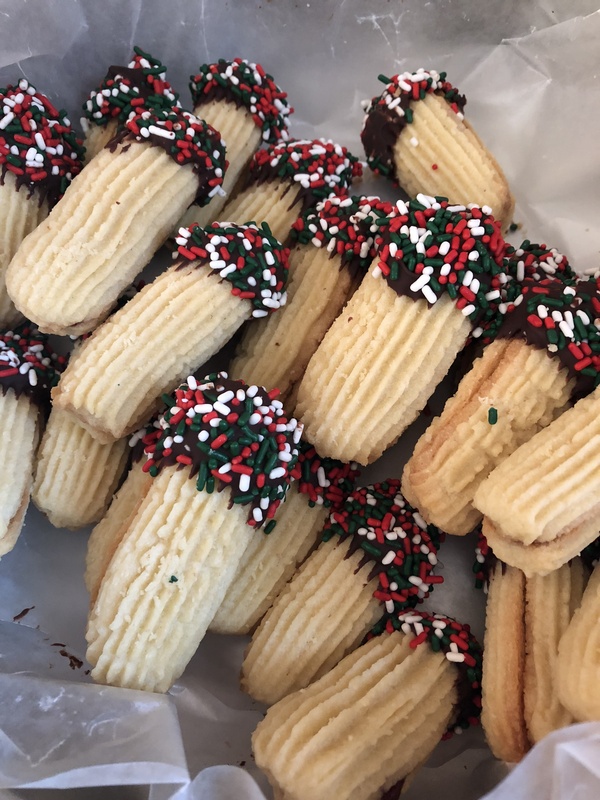 Filled with good times with friends and family and delicious food and treats. I am planning on getting my house back to “normal” this week. I unplugged my Christmas lights this morning, I never want to be the house with the lights on after the fact, and will start taking down decorations today. Not like it’s a lot, but, I don’t want to just rip it all down and throw it back in the box. I like to take my time. How has the New Year been treating you thus far? A week in and I have no complaints. Although one could complain but it doesn’t mean anything will change overnight. I am not one to make resolutions. If you want to make a change then make it. I read an article recently that said we sometimes make these grand resolutions without truly giving thought as to how to accomplish them. You can’t simply say I am going to lose weight this year. There has to be something behind it. For example, I will walk/jog/run x amount of days per week, or I will watch my intake of certain foods, and so forth. I think making small life changes like that can have a bigger impact on one that some broad goal. I do apologize if that is your resolution and I just burst your bubble. By no means was that my intention. And while I don’t make specific resolutions I think what I am trying to keep in mind this year is Einstein’s definition of insanity… Doing the same thing over and over and expecting different results. I know I want certain things to happen and other things to change but hoping they will happen without doing anything differently isn’t going to get my anywhere near those goals. I hope you will all get something out of that one. It’s definitely an important life lesson that can drive us to take chances and push us out of our comfort zones, which I have found always leads to a rewarding experience. There’s nothing like finding out you are a lot stronger physically, mentally and emotionally than what you think. One thing I need to stop doing this year is being a procraftinator. Yes, you read that correctly, a procraftinator. I have numerous projects lying around that need to be finished. Just how bad am I? Well, I have a shrug that I finished knitting 3 years ago that I still haven’t stitched together. Don’t ask me why, I can’t really give you an answer on that one. Maybe it’s because finishing my yarn projects is my least favorite activity. But, I am sure once I start and finish I will be so happy I did. I also have a scarf I started over the summer (or maybe it was sooner) that I put down and just never picked up again. This seems to a recurrent problem of mine… LOL! I just put something else on my knitting needles that I am determined to finish, especially since it’s a small project, a coffee cozy. A friend gave me a cup for Christmas that needs one if I plan on drinking hot tea from it. I began to think that just maybe I could make them and sell them on my Etsy shop. Yes, I still have my Etsy shop (CraftedByFran). I haven’t mentioned it, but, it’s still there. I have actually found it a bit frustrating because getting sales is such a challenge, well, getting traffic to my shop is the main challenge. I have updated my keywords and still nothing. Not really sure how some people have it so easy. If any of you can offer some tips and tricks I am all ears! And just maybe this year I will work on creating my own baking recipes. Cooking is a lot easier and forgiving, but, baking not so much. I have dabbled with it and have had success but I definitely need to delve more into it. I always have recipe ideas swirling around in my head, but I just need to build the confidence to come up with the ingredient list on my own and not depend on Google so much. I have baked enough that I should be able to do so. Who knows, maybe one day I will write my own cookbook. It would definitely be a mish mosh of different things… LOL! Did I just throw something out into the universe? Oh wait, I didn’t explain that one. Some people believe that in order for things to come to fruition you need to say them to the universe. I guess the universe needs to hear you in order to answer you. Hopefully I will be blogging more often and including more posts like these. A little rambling, a little insight, a little more about me. I’ve been doing this for about 7 years now so I figured it’s about time. So, I welcome 2019 and whatever it has to offer and teach me. 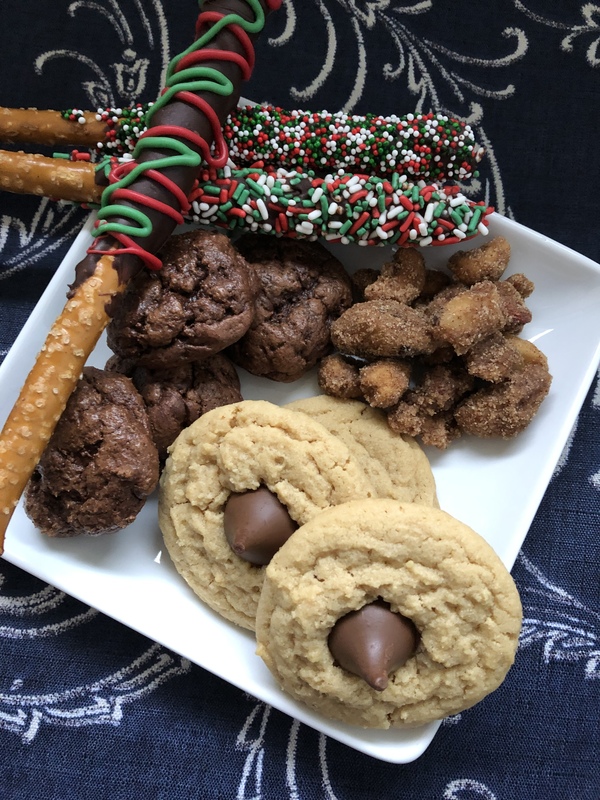 Sweet & Salty is as good a combination as you can get and there’s no better way to get satisfy that craving for both than with chocolate covered pretzels. 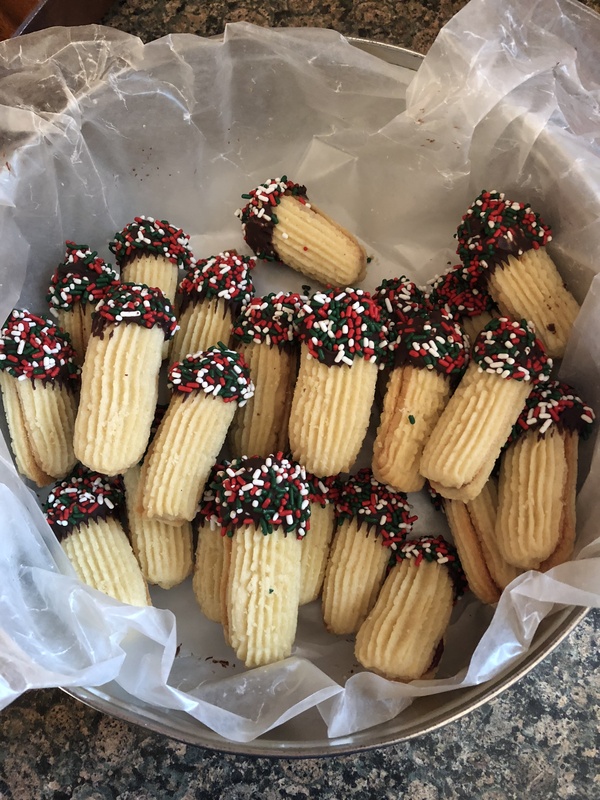 If you’re looking for a last minute treat to give your loved ones this Holiday season these may be the answer. You only need three ingredients to make them, pretzels, chocolate and a topping (if you choose). 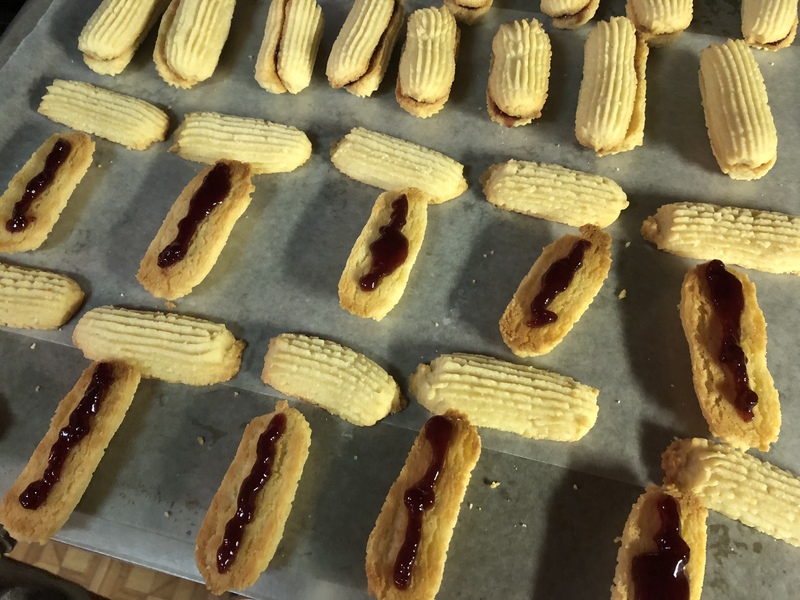 Now, when I’ve made chocolate covered pretzels in the past I’ve used the mini pretzel twists and while they taste good I always have an issue with getting the excess chocolate to drip off… It never does. I never end up with pretzels that are nice and evenly coated with chocolate, there is always one or two spots that has a little too much. 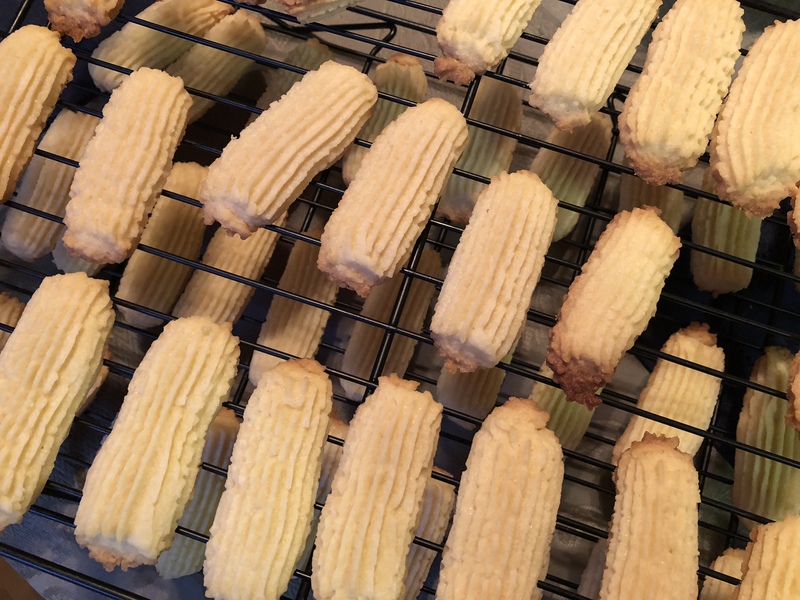 As I mentioned, they taste good, but, I am just not 100% happy with how they look. 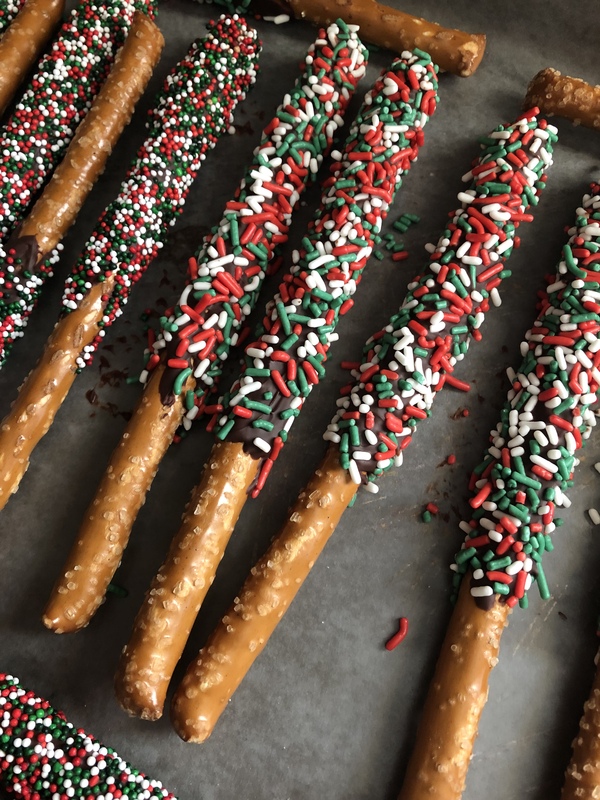 This year, I decided I would make chocolate dipped pretzels rods rolled in sprinkles. Figuring that the sprinkles could easily cover any imperfections with the chocolate. Which it did! Now, I know a lot of directions for chocolate covered pretzels call for a bit of shortening to be added to the chocolate when melting, I have never done this. From what I have read the shortening creates a smoother and more manageable consistency of chocolate – which I suppose would be ideal for the chocolate covered pretzel twists – but, I have also read that it can alter the flavor of the chocolate and that sometimes the chocolate doesn’t harden as well, so I stick with plain old chocolate. If I find that the chocolate is beginning to thicken too much while I am working with it I pop it back in the microwave for a quick 10 seconds just to get it smooth again. Not much longer because I don’t want to scorch the chocolate. Oh, and I melt my chocolate in the microwave as well. 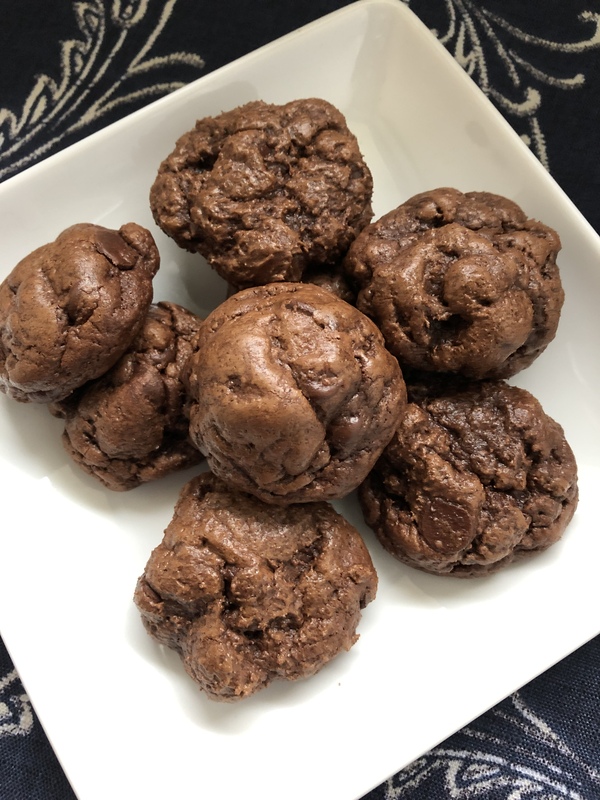 I have melted chocolate in my own make-shift double boiler – I place a bowl over a saucepan of simmering water – but, I find the microwave quicker and with less clean-up. 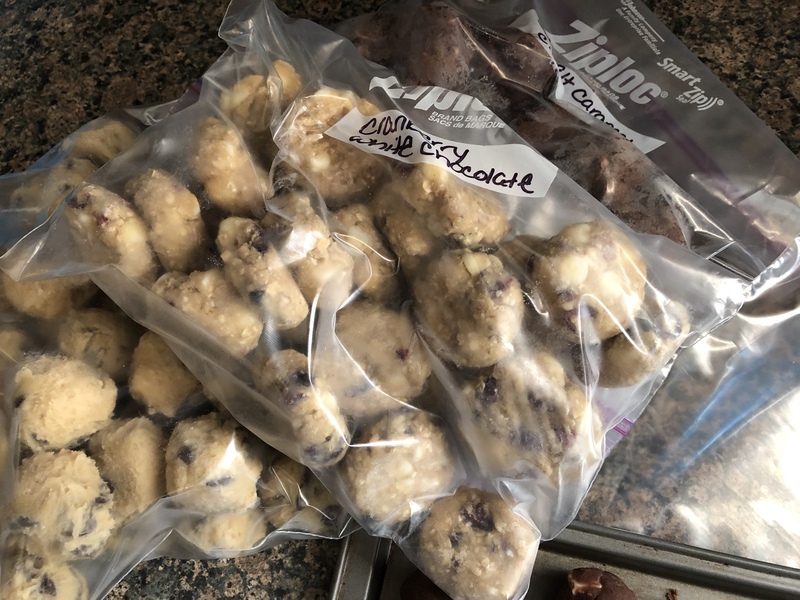 I simply pour a bag of semi-sweet chocolate chips into a microwave-safe bowl (I normally use a silicone one) and heat it for 1 minute. I give it a good stir and continue melting the chocolate in 30 second intervals, stirring the chocolate between each zap in the microwave. I don’t melt the chocolate completely in the microwave. Once it begins to melt stirring it will help melt the rest of the chocolate into a smooth mixture. 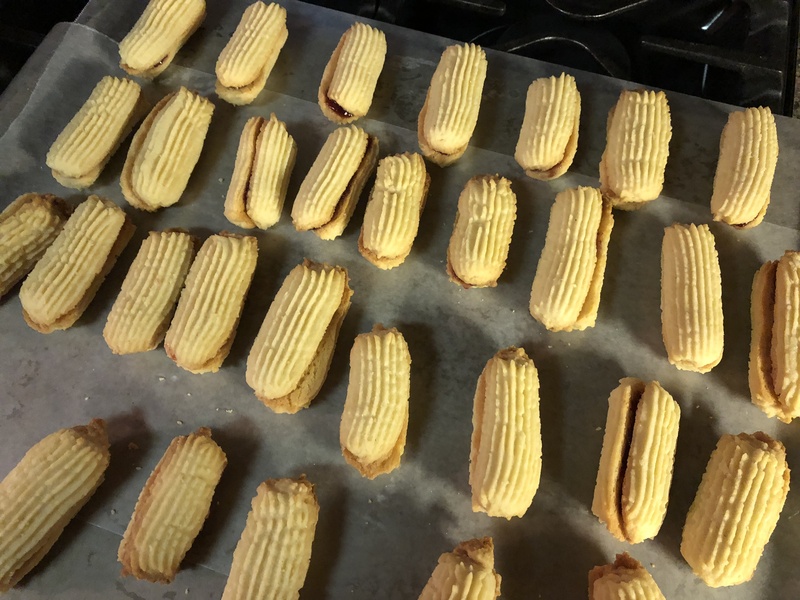 For dipping pretzel rods you want to use a small bowl that is pretty deep so you can get a lot of the pretzel rods coated in the chocolate. 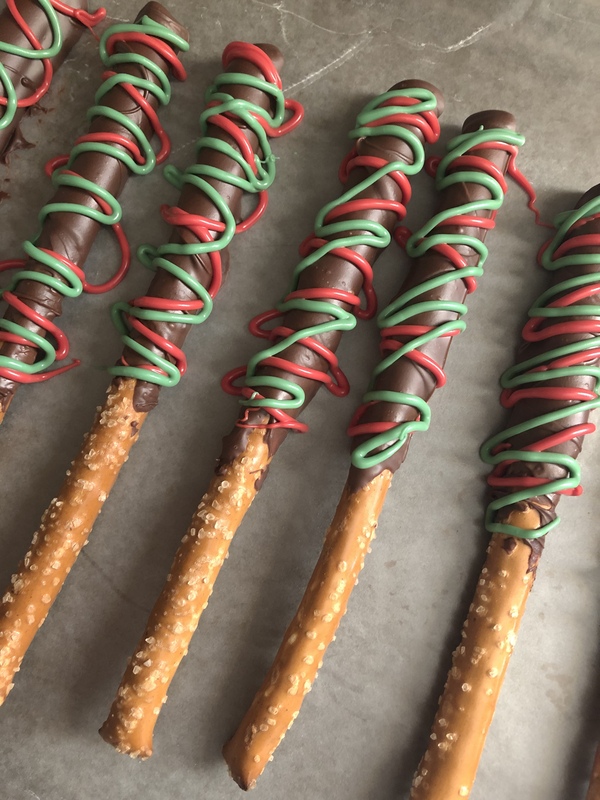 As you go along and find yourself with less and less chocolate but pretzel rods remaining you can use a spoon/knife to spread the chocolate on to the rod. Once the chocolate is ready I pour my sprinkles onto a rimmed baking sheet and push them to the center of the pan. 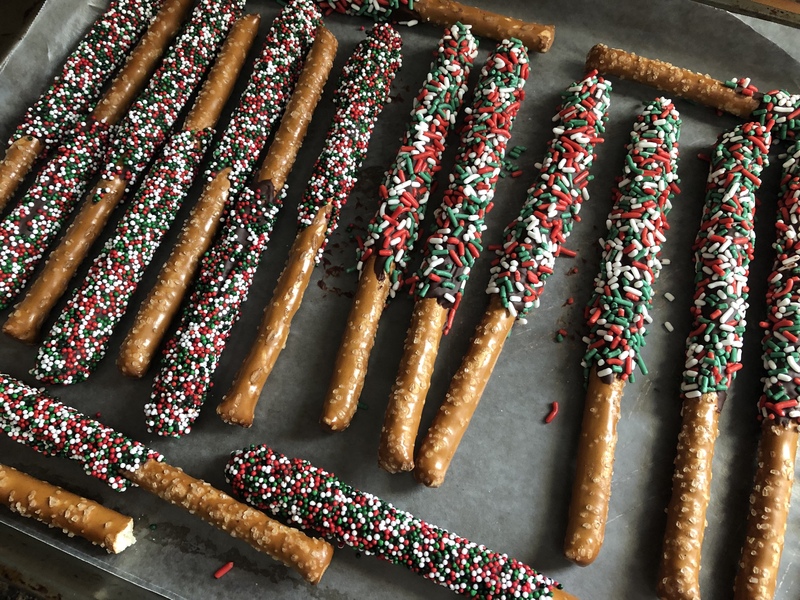 Using a baking sheet will make it easy to roll the pretzel rods in the sprinkles. 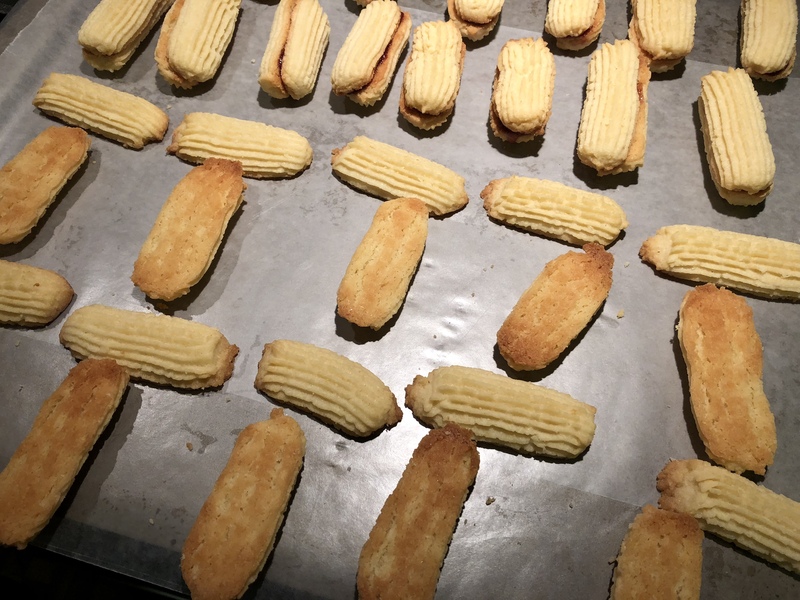 I set up another baking sheet with wax paper to place the rods on once they are dipped and sprinkled. And then I simply dipped a rod into the chocolate and then rolled it in the sprinkles. I then placed it on the wax lined paper so it could set and once I was done I placed the entire pan in the refrigerator to be sure that the chocolate would harden. 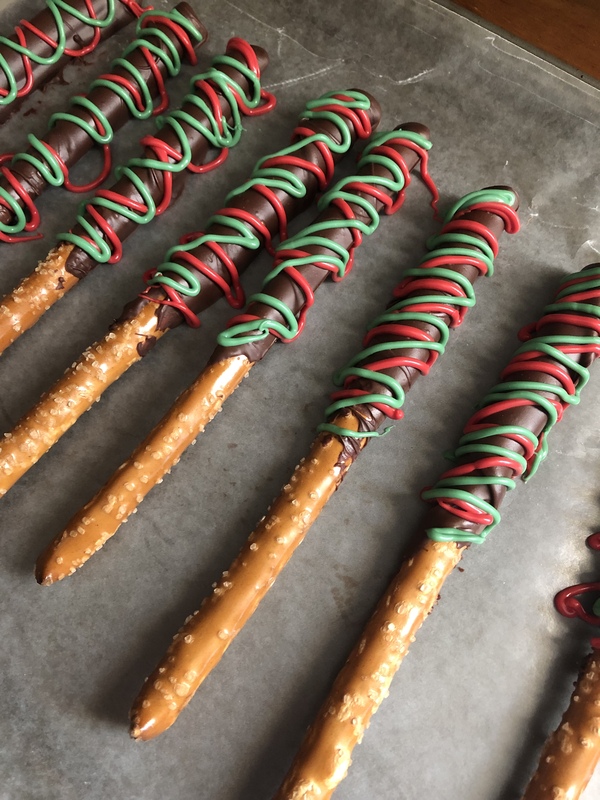 Here are some tips that may help you get a good coating of chocolate on your pretzels… If you have too much chocolate and it’s just not dripping off use a butter knife to smooth it out, or, another pretzel rod. I did the latter a few times. I simply rolled the pretzels next to each other over the bowl to coat the one without the chocolate. 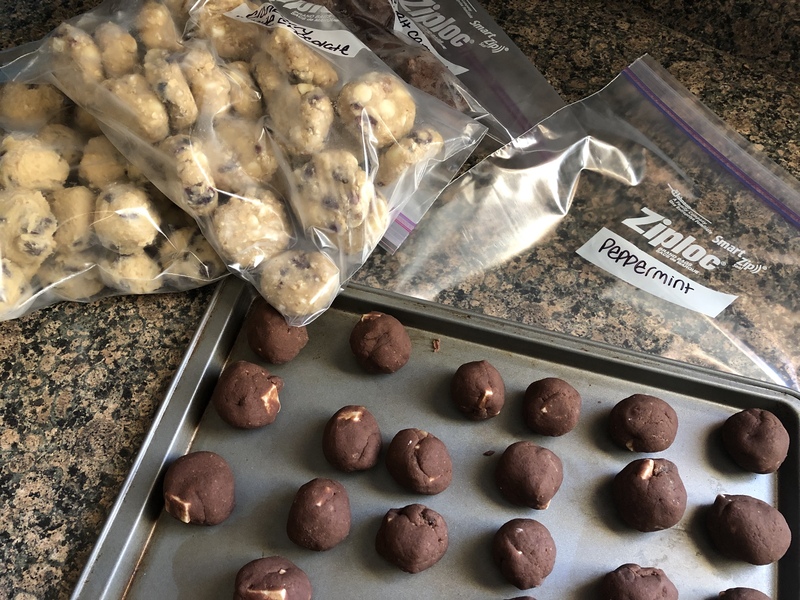 For those rods that I wasn’t planning on rolling in sprinkles I actually rolled it on a sheet of wax paper to smooth the chocolate out and then placed them in the refrigerator so the chocolate could harden and then drizzled them with the red and green chocolate the following day. To do so, I melted candy melts and then poured it in squeeze bottles and drizzled the chocolate over the pretzels and once again placed the sheet back in the refrigerator so the drizzle could harden. My apologies for not having step-by-step pictures, but, I made these late at night (a lot later than I had planned since my car decided to act up that day and I had to be towed from work to the mechanic and then have a friend bring me home… thankfully my car was fixed and back on the road the following day!) and I have learned that late-night pictures are not good for blogging! So, to recap, all you need for these Chocolate Covered Pretzels is a bag of pretzel rods (I used a 12oz bag that had about 30 good (unbroken) pretzel rods), a 12oz. bag of semi-sweet chocolate chips, and to decorate sprinkles, candy melts, chopped nuts or coconut. 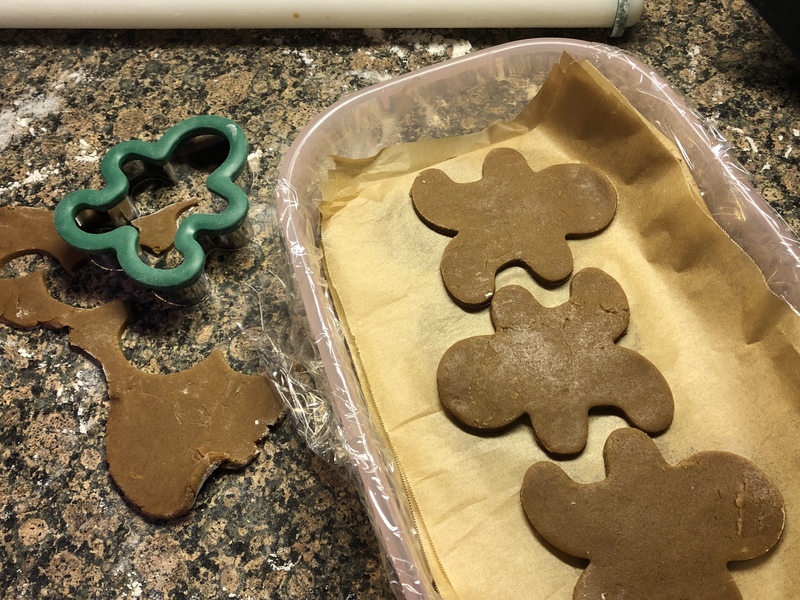 You will also need wax paper, at least 3 baking sheets and a bowl to melt and dip the chocolate. Each day this week I will be bringing you a cake / cupcake idea that is perfectly festive for this time of the year… It’s Holiday Cake Week. 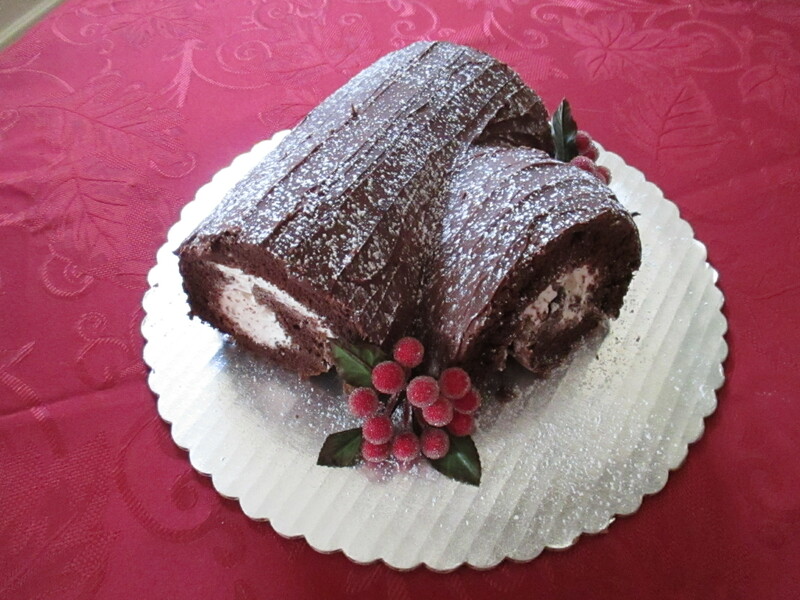 To kick off Holiday Cake Week a traditional cake seen around the holidays… A Yule Log Cake. It originated in France and is a sponge cake rolled and then frosted with chocolate frosting to resemble a tree bark. Customarily a small portion of the cake is cut off and either placed on top of the cake or protruding from the side of the cake to resemble a chopped off branch. The cake can then be furthered decorated with powdered sugar to resemble snow, fresh berries, mushrooms made of marzipan and so forth. I opted to go the easy route with my cake and used a box cake mix and a container of vanilla frosting for the filling. Also, while the recipe didn’t call for it, I ended up a slicing off a portion of the cake and placing it on the side to get that traditional branch look. And to top it off, I sifted confectioners’ sugar over the cake and placed some decorative holly berry picks I got from a local craft store around it. Heat oven to 375 F. Line the bottom of a 15x10x1-inch (Jelly Roll Pan) pan with foil or waxed paper, spray with baking spray. In a large bowl beat the eggs with an electric mixer on high until the eggs are thick and lemon colored, about 5 minutes. Add the cake mix, water and oil and beat on low speed for 30 seconds, then on medium speed for 1 minutes. Pour about 2 3/4 – 3 cups of the batter into the prepared pan. 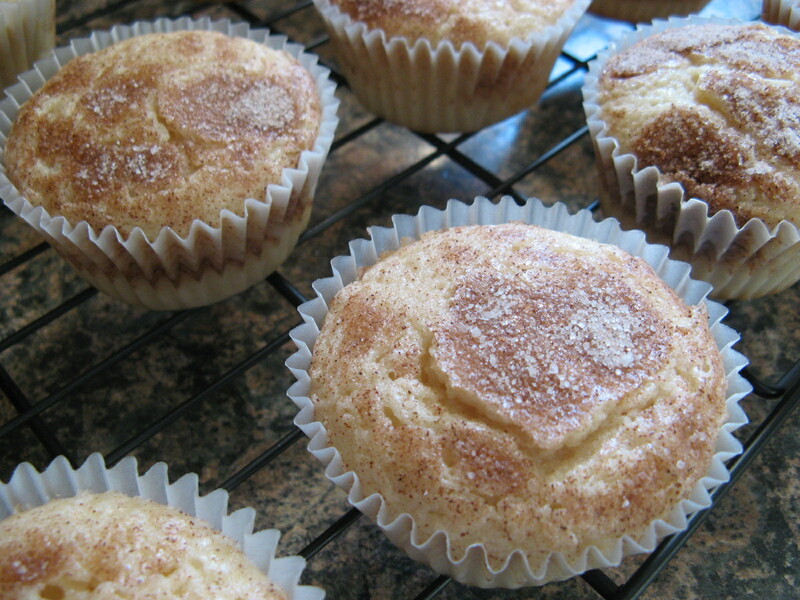 Use the remaining batter to make cupcakes, or as you wish. Bake 14 to 16 minutes, or until the cake springs back when lightly touched in the center. Turn the cake out on a clean kitchen towel sprinkled with the confectioners’ sugar. While the cake is still hot, carefully roll up the cake and towel together from one shorter end to the other. Cool completely on a wire rack from 1 hour. While the cake is cooling make the chocolate frosting… In a medium pot heat the whipping cream over medium heat until the cream starts to boil. Remove from the heat and add in the chocolate chips and corn syrup, let stand for 3 minutes. Beat with a wire whisk until smooth and then add in the vanilla. Refrigerate for about 1 hour, stirring every 15 minutes, until it’s a spreadable consistency. After an hour, unroll the cake carefully and remove the towel. Spread the vanilla frosting evenly over the cake and roll it up once again. 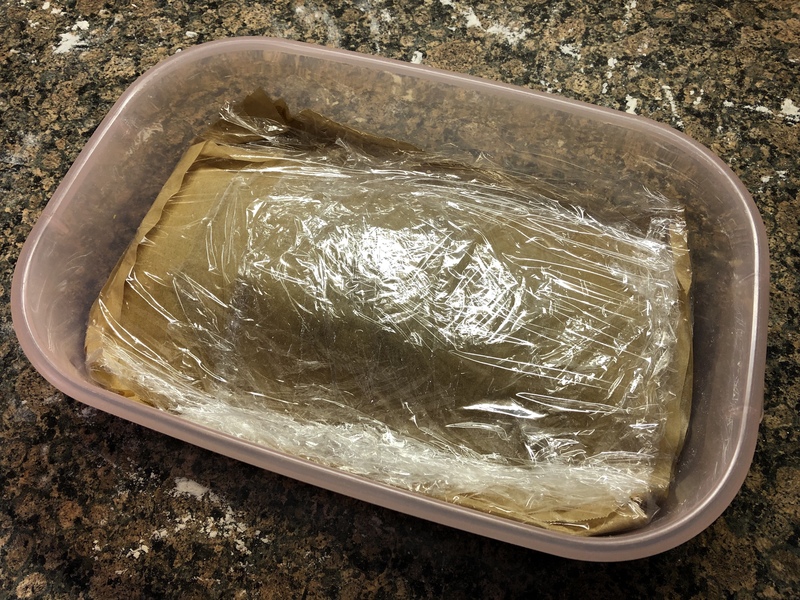 Place the cooling rack on sheet of waxed paper and return the cake to the wire rack and frost the cake with the chocolate frosting. Drag the tines of a fork through the frosting to give the cake a log look. Let the cake stand for 15 minutes and then refrigerate loosely covered until ready to serve. Let stand at room temperature prior to serving. *If you want to make the log resemble more of a branch, prior to frosting with the chocolate frosting, cut a piece of the cake off and place on the side of the cake or on top and then frost.